Alien Explorations: Does the cover of The Pink Panther comic No.18 reference the Henu Barque? The outer column of the fan turns into the doughnuts. The wrist bands on the crouching man's arm merged with the idea of the skirt, turns into one towel hanging from an arm. The upper kestrel head with collar becomes a coffee cup and saucer, while the lower kestrel head on the left becomes the pot of coffee with the left lump of white becomes the coffee inside. The middle and right white shapes become Inspector Clouseau's head. 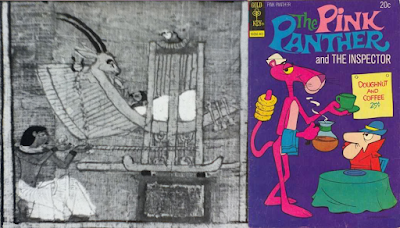 The oryx head becomes the Pink Panther's head while perhaps the horns are turned into the rim of the small hat on his head. A loop used for tying the boat down to the sledge runner becomes a plate on the table, while the sledge runner becomes the lower curve of the table surface. 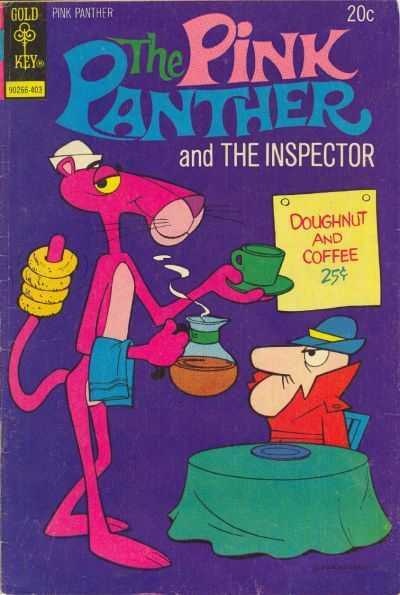 Meanwhile the boat itself becomes the upper right arm of the Pink Panther and the collar of Inspector Clouseau.